140th Year Anniversary of Black Friday 1869 Banking Panic, History Repeating? Today is the 140 Year Anniversary of the original Black Friday on September 24th, 1869. Since then the word ‘Black’ has been used to describe any day that the stock market, currencies or financial markets have crashed. There have been many, many such crashes but the one that birthed the term happened on this day 140 years ago. This financial crisis is one of the many to have challenged humanity throughout history. It came about when the Union government started printing non gold backed dollar “greenbacks” to finance the war effort and a subsequent attempt to corner the gold market. This led to a bank panic where savers attempted to withdraw their life savings (in gold coinage) from banks causing a bank run. The "Boy of the period" stirring up the animals, 1869. 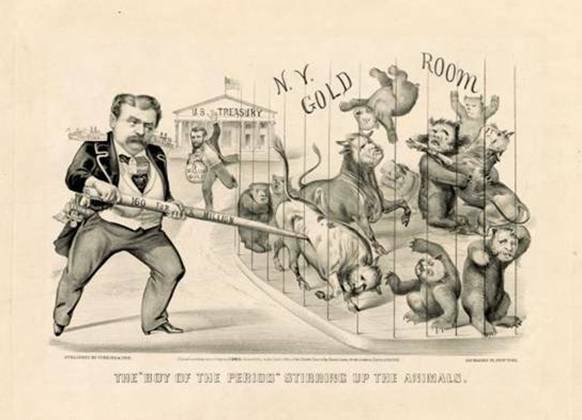 Print shows a caricature of financier Jay Gould, left, who attempts to corner the gold market, represented by bulls and bears in a cage. On Black Friday, September 1869, in the midst of scandal, President Ulysses S. Grant, center, restored prevailing gold prices by having the U.S. Treasury sell five million dollars in gold which he brings forward in a bag. The US Civil War was an important factor in creating the crisis. Indeed, gold prices fluctuated in paper dollar terms as various battles were won or lost in the Civil War. The Union’s efforts to battle Confederate forces were financed by the floatation of“greenbacks” by Abraham Lincoln. No longer backed by gold or silver reserves, these were promissory notes, redeemable at some indeterminate future date for specie-backed currency. Gold began to rise in price in greenback terms on speculation that these greenback paper dollars issued would fall in value due to the money printing by the Union government. Speculators and investors accumulated gold in anticipation of higher prices. Gold then fell in price as the Union government flooded the gold market to suppress the price of gold and preserve the value of the greenback dollar. The two sides in the Civil War had gone off the Gold Standard in order to finance the American Civil War. The large amount of paper money or ‘greenbacks’ issued by the Union government was backed by nothing but credit and the “full faith” of the government. During the Civil War, the greater value of gold compared to paper money resulted in a post war premium for the finite currency of gold, which during 1868 and early 1869 ranged from about 35 to 42 -- meaning that 135 to 142 paper greenback dollars were required to purchase 100 gold dollars. The variation in prices tempted speculators and investors to buy gold bullion in order to protect against a decline in the value of the freshly printed paper money. Black Friday led to increasing distrust of politicians and governments involving as it did a corruption and nepotism scandal. Financier and stockbroker Jay Gould and railroad tycoon James "Diamond Jim" Fisk, like many of their counterparts in banks today, carried financial buccaneering to extremes. Their conspiracy included the wholesale bribery of legislatures, the buying of judges and seeking to influence the President. They ‘enlisted’ President Grant's brother-in-law to persuade the President into paying a higher rate for gold after they'd amassed a very large holding. They let it be known around Wall Street that President Grant was in their corner and that he would not use the Union gold reserves to flood the market and suppress the price. Gold as expected soared from $144 to $164 (greenback dollars) in a matter of hours. Demand grew so strong that militias were dispatched to put down the violence that was taking place at banks as depositors demanded their gold. Some threatened to hang bankers who wouldn't pay out. The President realizing the serious nature of what was transpiring ordered his Treasury Secretary to announce that gold from the reserves would be sold into the market. The Union government didn't have the $4 million worth of gold it claimed to have. The Treasury Secretary later said he had made a "mistake" and meant to say $400,000, but added a zero. The threat of a flooded market ended the run on gold. In just one hour, gold fell from $162 to $135 (greenbacks) or some 20%. New York: E.P. Dutton, 1988, p. 137. The effects of Black Friday caused dislocations in the financial markets which lasted into 1870. The term "Black Friday" came about as nervous depositors withdraw their gold coin savings from banks. Angry mobs dragged bankers out of their offices if they did not give back people’s life savings (in gold coins) and there are reports that bankers were hung in New York. Grant’s government had to send in troops to stop the riots. Many speculators and investors were wiped out. One Hundred and Sixty! Can’t be true! What will the bears-at-forty do? How will the merchants pay their dues? How will the country stand the news? What’ll the banks—but listen! hold! They had killed their Goose with the Golden Egg! The fall in the gold price led to the stock market plummeting and deflation which then rippled into the broader economy. The stock market crash of 1873 (like its 1929 counterpart) was more damaging and led to a ‘Long Depression in the United States and much of Europe’. It is interesting that the price of gold fell from 162 paper dollars back to the previous level of 135 paper dollars. This is some 20% which is nearly the same amount that the Dow Jones Industrial Average fell in one day in 1987 (-22%). It is also worth remembering that the Dow Jones Industrial Average fell by about 90% into the 1932 low and the Nikkei fell from over 40,000 to 7,000 or by some 80%. The moral of the story is that history has a habit of repeating itself and there is nothing new under the sun. The laws of economics state that that which is in short supply will rise in value and that which is in abundant supply will fall in value. With governments internationally printing the modern version of paper greenbacks on an unprecedented scale, prudent investors and savers should be diversified and have an allocation to precious metals. Great article! We love pieces written about market history--always something new to learn. The current set ups is more bearish than last year’s according to our stock market model. We’re on record calling for a 50% crash and we have clients in cash or bearish ETF’s. 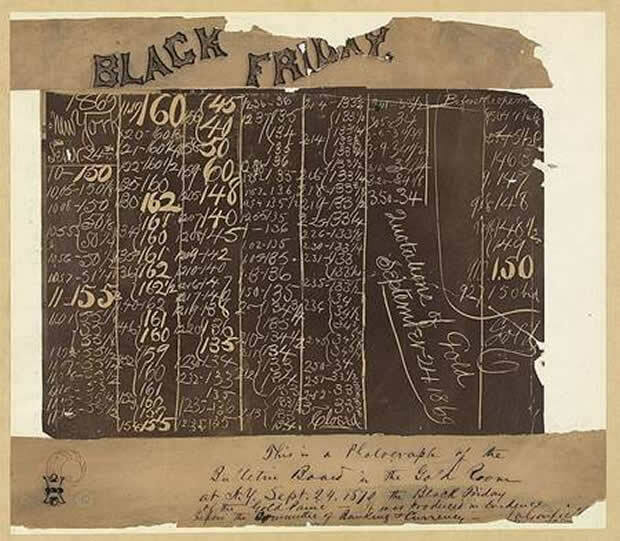 Its a great news that the Black friday passed 140th years of it.There is huge past and history of this black friday. Nice to see this info. Visit this for more info on blackfriday 2009.